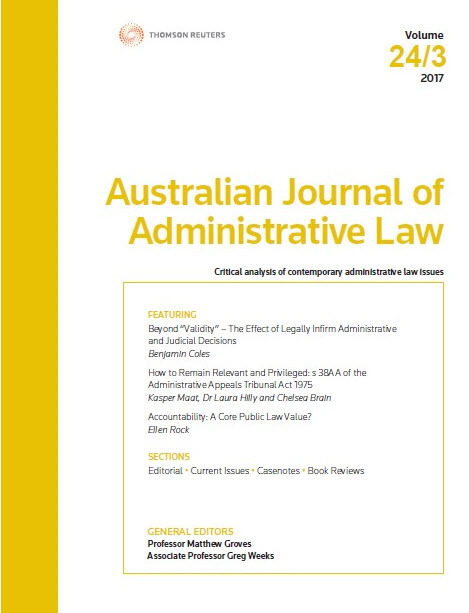 The Australian Journal of Administrative Law (ISSN: 1320-7105) provides subscribers with current and critical commentary on contemporary developments in administrative law. Included in each issue is a range articles and sections on Current Issues, Casenotes and Book Reviews. The articles and sections are written by recognised practitioners and academics. Professor Matthew Groves is Professor of Law at Deakin University and a fellow of the Australian Academy of Law. He teaches and researches public law, particularly administrative law. Prior to joining Deakin University, he was a professor in the La Trobe Law School. Matthew has written and edited many books on administrative law and is a former member of the Administrative Review Council. Matthew is one of the key co-authors of the leading text, Judicial Review of Administrative Action and Government Liability (6th ed, Thomson Reuters, 2017). Associate Professor Greg Weeks is an Associate Professor and Deputy Head of School in the ANU College of Law at the Australian National University. He teaches the compulsory Administrative Law and Torts subjects in addition to the Advanced Administrative Law elective. Greg’s research interests are primarily related to judicial review, state liability and remedies against public authorities. He has published widely in these fields. Greg is one of the co-authors of Judicial Review of Administrative Action and Government Liability, Australia’s leading administrative law text (6th ed, Thomson Reuters, 2017). The Australian Legal Journals Index is an online legal database prepared by the Lionel Murphy Library of the Commonwealth Attorney-General’s Department. It is produced by Thomson Reuters and is available via subscription. The ESCI (Emerging Sources Citation Index) is an online database formerly produced by Thomson Reuters and now maintained by Clarivate Analytics. It is part of the Web of Science Core Collection and is available via subscription. To subscribe to this Journal or purchase individual articles, please visit our “Subscribe or Purchase” page. For the individual contents pages for each Part, click here. This Part includes the following articles: “Commonwealth Government Contracts, the ‘Common Assumption’ and Statutory Backing” – Nick Seddon; “The Victorian Civil and Administrative Tribunal and the Rules of Evidence” – Duncan Wallace; and “Declaratory Relief and Public Law Litigation in the 21st Century” – Leigh Howard. Also in this Part are the following sections: Current Issues; Casenotes: Plaintiff M174/2016 v Minister for Immigration and Border Protection (2018) 92 ALJR 481;  HCA 16 and BGH16 v Minister for Immigration and Border Protection  FCCA 1009; and Book Reviews. This Special Issue on the Charter includes an introduction by Justice Pamela Tate, and the following articles: “Administrative Decision-Making under Victoria’s Charter” – Janina Boughey and Adam Fletcher; “How Does the Charter Affect Discretions? The Limits of s 38(1) and Beyond” – Bruce Chen; “Judicial Review and the Charter” – Mark Aronson; and “Judicial Review and Human Rights” – Matthew Groves. This Part includes the following articles: “Beyond ‘Validity’ – The Effect of Legally Infirm Administrative and Judicial Decisions” – Benjamin Coles; “How to Remain Relevant and Privileged: s 38AA of the Administrative Appeals Tribunal Act 1975” – Kasper Maat, Dr Laura Hilly and Chelsea Brain; “Accountability: A Core Public Law Value?” – Ellen Rock. Also in this Part are the following sections: Current Issues; Casenotes: Privacy Commissioner v Telstra Corp Ltd (2017) 262 IR 230;  FCAFC 4; and Book Reviews. This Part includes the following articles: “Who Decides the Validity of Executive Action? No-Invalidity Clauses and the Separation of Powers” – Lisa Burton Crawford; “Challenging Huynh: Incorrect Importation of the National Interest Term via the Back Door” – Jason Donnelly; “Merits Review and the 21st Century Tribunal” – Juliet Lucy. Also in this Part are the following sections: Current Issues; Casenotes: Construction Forestry Mining & Energy Union v Director, Fair Work Building Industry Inspectorate (2016) 91 ALJR 1;  HCA 41; and a Book Review.